Craig Brown, a law professor at the University of Western Ontario, once wrote that “Golf and the law seem to have been made for each other.” And it is true: a sport that is beloved by many lawyers is also fertile ground for lawsuits. Although California has done much to curb golf-related lawsuits, the issue of golfer’s liability continually gets tested in courts throughout the state. Especially in Los Angeles, golf ball injuries are extremely common. The issue of golfer’s liability becomes more contentious when children are involved. Whether they are on the course learning the game or playing in a backyard adjacent to a golf course, children between the ages of five to 14 comprise roughly one-quarter of all golf-related injuries. And according to a study published by the Department of Mechanical Engineering at the National University of Singapore, children are particularly prone to head injury when stricken by a golf ball on the frontal and temporal areas. The personal injury attorneys of the Law Offices of Edward Deason handle the full range of head and brain injury cases, regardless of cause. Sports injury cases of any sort require special experience and knowledge, as establishing liability in such cases can be a tricky matter. In some cases, even though it may seem unfair that the victim of a sports injury is responsible for his or her own expenses and losses, the law protects the person responsible for the injury. The difficulty lies in proving negligence when the participant in the sport was simply playing by the rules when an accident occurred. Nevertheless, there are many cases in which negligence can be proven, even in golf. If your child has been injured by an errant golf ball, especially while on the golf course either as a player or a spectator, don’t assume that you are responsible for the resulting losses and expenses. 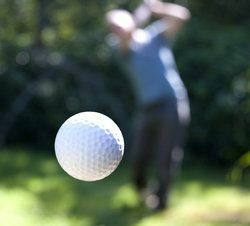 Especially in cases involving serious injuries, such as brain injuries, the golfer who hit the errant ball may be liable, especially if no warning was given prior to the shot. The personal injury attorneys of the Law Offices of Edward Deason can evaluate the circumstances surrounding your case and advise you of your legal rights and options. Call or email our law offices today to arrange for an evaluation of your case. While it can be extremely difficult to prove negligence in a golf injury case, especially in California, our attorneys have the experience and skill to present the strongest case possible on your behalf.